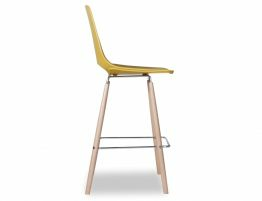 The Orange Wasowsky Bar Stool is a welcomed addition to the collection of modern furniture for both home and commercial spaces. 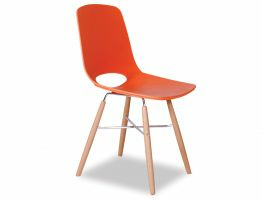 Inspired in part by the Eiffel chair from Charles and Ray Eames, these designer orange modern barstools brings the best of midcentury modern furniture up to the present with some new and unique design features. The polymer plastic shell is paired with beech wood and finished with chromed steel bracing and footrest. 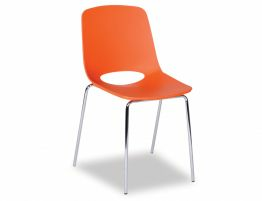 This orange wood barstool looks great in your home, restaurant or commercial dining furniture spaces. 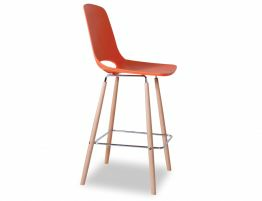 With stylish comfort and clean, modern lines, this contemporary orange barstool is a must have. 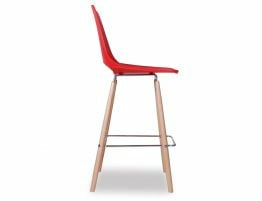 Offered in two varying heights, a 68cm kitchen bench height and a 77cm commercial bar height, this orange wood and plastic barstool is sized to fit most spaces. View the complete collection of furniture from Enrique Marti Associates for OOLand to find a coordinating dining chair and other modern colours to select from.